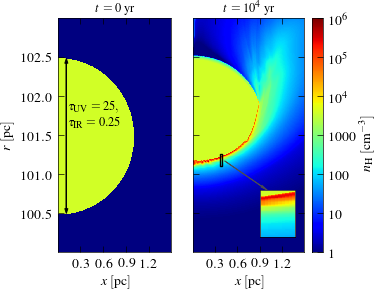 The figure shows a radiative-hydrodynamic simulation of a dusty cloud irradiated by a quasar (located at r = 0). Radiation pressure is set to be the dominant pressure source. Left panel shows the initial conditions, while the right panel shows the cloud 10^4 years after exposure to the quasar radiation. A quasi-static density gradient develops at the HII surface layer, spanning a factor of ~10^4 in density (zoomed on in the inset). The length scale of this gradient is only ~0.01 pc, a factor of 10^4 smaller than the cloud-quasar distance. Jonathan Stern in collaboration with J. Onorbe. Credit: Jonathan Stern in collaboration with J. Onorbe.